ISO 39001:2012 specifies requirements for a Road Traffic Safety Management System. It enables an organization that interacts with road traffic system, to reduce death and serious injuries related to road traffic crashes. 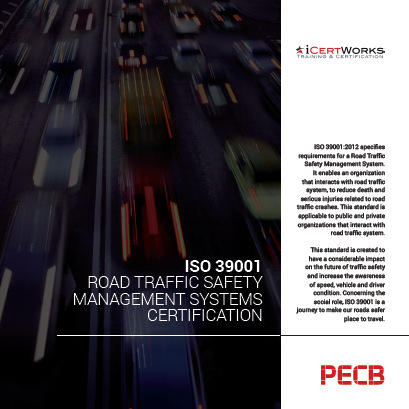 ISO 39001:2012 specifies requirements for a Road Traffic Safety Management System. It enables an organization that interacts with road traffic system, to reduce death and serious injuries related to road traffic crashes. This standard is applicable to public and private organizations that interact with road traffic system. This standard is created to have a considerable impact on the future of traffic safety and increase the awareness of speed, vehicle and driver condition. Concerning the social role, ISO 39001 is a journey to make our roads safer place to travel. ISO 39001 certification (also known as "registration") is a third-party audit performed by a certification body such as PECB who, upon verification that an organization is in compliance with the requirements of ISO 39001, will issue an ISO 39001 certificate. This certification is then maintained through regularly scheduled annual surveillance audits by the registrar, with re-certification of the Road Traffic Safety Management System performed on a triennial basis. For more information on ISO 39001 Certification, please fill out the form on the right side of the page. Contact us about ISO 39001 Certification!